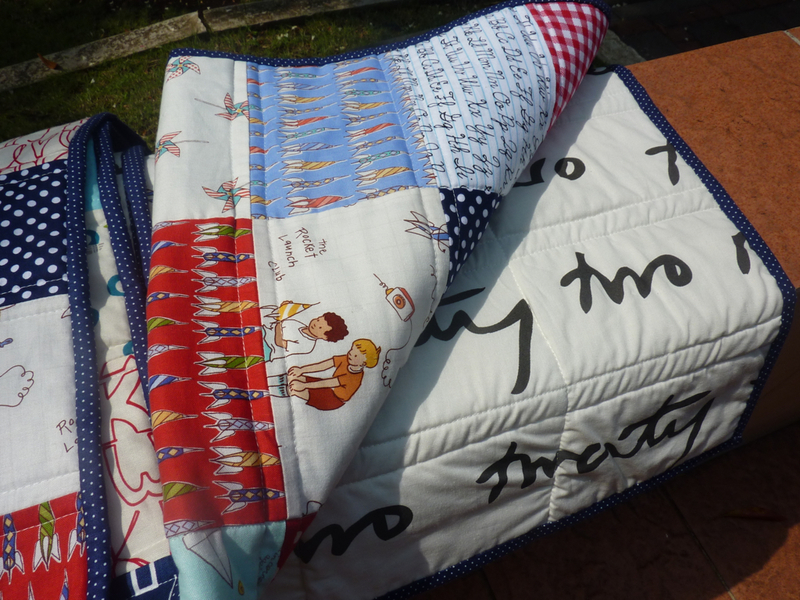 Sunshine Through the Rain: The Quilt with Issues! This was supposed to be a quick quilt - one that came together easily, and I could check off my list of presents I need to get made before the start of June. I chose the fabrics and pattern (found here) and pieced the top together fairly easily. But the problems came when I started basting. The fabric I had bought for the backing slid around on the tiled floor and I kept getting creases in the back. When I had finally sorted that out, it only got worse once I started quilting. The backing fabric just kept puckering and pulling. In the end, after getting some advice on Instagram, I pulled all the quilting out, pulled the pins out, and dug through my stash to find another piece of backing fabric. Thankfully I had a piece big enough, and was able to finish it all off. Lesson learnt: Don't resort to cheap, loosely woven fabric, even for backings! In the end I really like how it turned out. It is a present for my 4 year old nephew, who I haven't seen since he was two months old. Less than three weeks to go now and I will see them all again - to say I am excited is an understatement! 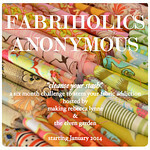 Oh, and to those of you in the UK, what fabric shops do you recommend I visit? I will be staying in Bristol, London and Cambridge. I really need to experience what it is like to browse in a fabric shop as I haven't had the opportunity to do that before! Linking up with Sewjo Saturday and Sew Cute Tuesday. And amazingly this is my sixth finish for the Q2 FAL 2014, and my May goal for ALYOF (original post here). Pulling out is so soul destroying! It has all been worth it though. And in London depending on where you are: http://www.tikkilondon.com/ check opening times before travelling, and of course http://www.thevillagehaberdashery.co.uk/ in West Hampstead. Obviously Liberty but, if Liberty's your thing, don't miss Shaukat on Old Brompton Road who have more Liberty than Liberty. I'm so glad it worked out in the end. 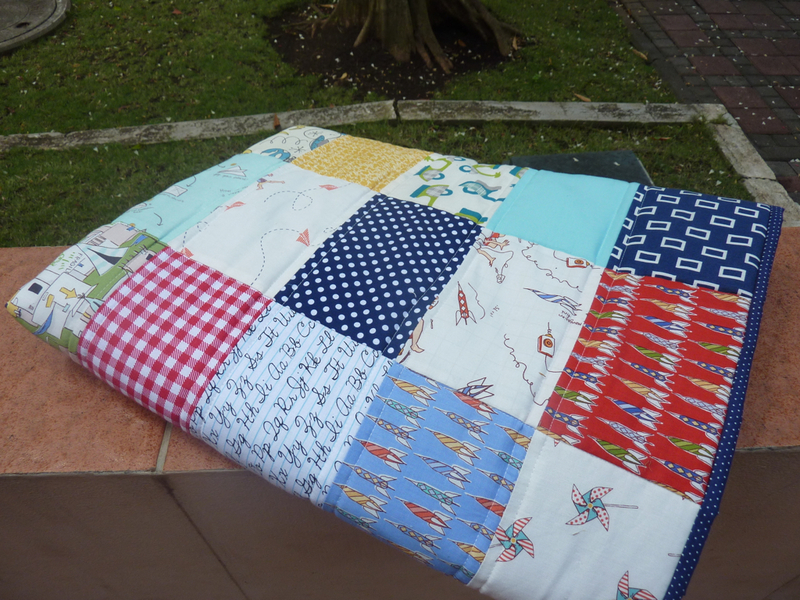 It's such a lovely quilt with lots of fun fabrics. How fun that you'll be going to a quilt shop for the first time. I remember being overwhelmed by all the fabrics in my first shop experience. It has turned out well but I feel your frustration. That's a lovely backing you ended up using - is it an IKEA one (no IKEA near us unfortunately)? You must be so excited! I admire you for pulling out the stitches and choosing a different back. That took time and patience, but so well worth it. Your quilt is beautiful! If you have never been to a quilt shop before here is the advice I give to people: have a project in mind or think of something you need. That way you won't be overwhelmed. My first time in a quilt shop made me car sick because my head was going in all different directions! Have fun! so much work and a lesson learned. so glad the story has a happy ending!!! Oh it's quilting law - the 'simple' quilts are always the most difficult lol. You've done a wonderful job and how exciting to be seeing your family and nephew! Can't help on shops in those areas but I'm sure you'll get some good recommendations. I love the simplicity of this quilt! You have inspired me to make one of my own.....when I come back from Europe! I'll give you a wave, shall i? 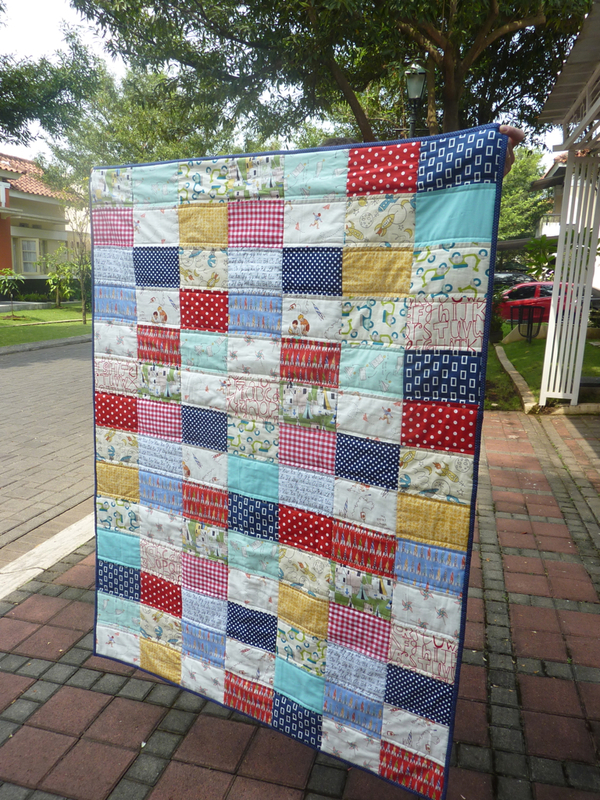 Nice quilt, and I really like the rectangular patchwork as opposed to ordinary squares. I have had to rebaste before and it is not fun!! Better to get it done right though and you did good by not just trying to push through and be unhappy with the result. The backing fabric really makes basting easy. as I found out too!! If your near east London/Essex let me know and I send the details of my local shop, it's not got kokka or Free Spirit fabric, but the lady is lovely and has lots of Moda, Lecien and Riley Blake! Also The Village Haberdashery is amazing in Hampstead and definitely worth a visit and drool!!! I love how the simplicity of the quilt lets the prints really shine! And admire you for stopping and restarting the project! Sorry to hear about your trouble. It turned out lovely. I like this look better than usual squares. oh no, that sounds like a disaster, I think I'd have been crying in frustration! I love the backing you used instead though and the quilt is lovely! I live in the Midlands so cant' help, but I'd love the visit the Village Haberdashery some day. Very cute. He's sure to love it. Worth all the extra effort. it is a beautiful quilt Deborah. Your nephew will be delighted. I'm glad to hear you were able to fix issue with the backing. It is so frustrating to have do pick all you hard work. But this one was worth the extra effort it is a fantastic quilt. Well done on undoing the quilting and starting again with better fabric. Your quilt is really lovely and is sure to be much loved. Once I start quilting, I just can't go back, no matter how much puckering there is. Not sure whether you have already visited bristol but the fabric shops here are make and do emporium in Brislington. Millie moon habadashery in keynsham and fabric plus in downend. All lovely to browse around.